The UE Boom 3 isn't the best sounding speaker on this list, but it's versatility and ability to float makes it one of the better choices for most people. The IPX4 Bose SoundLink Revolve+ isn't entirely waterproof, but it's well-designed to make up for it. The JBL Charge 3 is a versatile speaker that makes a great option for the pool or beach. The UE Wonderboom is one of the most portable and unique looking speakers you can buy. The Anker Soundcore Flare isn't the greatest sounding speaker available, but it holds its own against speakers twice as expensive and looks good doing it. Hot weather means two things: pools and beaches. But those aren’t the best places to bring your electronics. It doesn’t take a scientist to know that water and electricity don’t mix. That means if you want to bring your favorite speaker to have some tunes on the beach, you’re out of luck—unless it’s a waterproof speaker. Luckily, there are plenty of companies making water-resistant or waterproof speakers, but which is the best waterproof speaker? All of them are hoping their product is the one you grab with you before you head out. So, which ones are the best for you? Editor’s note: this list was updated on April 11th, 2019, to reflect changes in pricing and to add new notable mentions. We were never a huge fan of the UE Boom speakers here at Sound Guys, mainly because you can get better sound out of something like the JBL Charge 3/Charge 4, or even the Sony XB-41 speaker. That said, the clever design of the UE Boom 3 really impressed us and took the top spot on this list. The speaker has been redesigned so that it doesn’t just have a cylindrical shape like the older model, it’s now basically the same size and shape of your average water bottle now. That may not seem like a huge deal, but it means that you can now put it anywhere that you can fit a regular water bottle. Whether that’s in the cupholder of your car, your bike, or your backpack, or a beach chair, it’s a speaker you can now truly bring with you anywhere. The Sony XB-41 speaker that we had here before is still a great option, but it’s large size and heavy weight makes it far less portable for most people. It’s not just the size and shape that makes the UE Boom 3 a compelling option either. Of course, you’ll still have the characteristic +/- buttons on the front for volume control, but you can also link up the speaker with over 100 other UE speakers. So if you and a friend both have UE speakers you can download the app and double up on sound. Battery life is roughly 15 hours of constant playback which isn’t great, but it does have an IP67 waterproof build and like the smaller UE Wonderboom, it also floats. As I said, the sound quality on the Boom 3 isn’t great but if you’re at the beach or poolside and just want something loud and portable, this is a great option. Most durable speakers you’ll find tend to be small, super portable, and more on the rugged side. It’s rare that you find a water-resistant speaker that also looks good, but if you want quality design, then check out the Bose SoundLink Revolve+. This speaker isn’t cheap but you get what you pay for, which is a gorgeous Bluetooth speaker that’s perfect for hanging poolside in the summer. It’s worth mentioning that this speaker is IPX4 certified; so although it can take a splash or get rained on no problem, you’ll want to avoid throwing it in the pool as it isn’t completely submersible. But if you’re willing to sacrifice that spec and take a little more care of where you place the speaker, you’ll get a speaker that looks as good as it sounds. OK, maybe it looks a little better than it sounds, but it’s still a good sounding speaker overall. The SoundLink Revolve+ might not be portable enough to strap to your pack while going on a hike, but it does come with a small handle that makes it easy to move from place to place. It has a battery life of roughly 16 hours and even lets you access Siri or Google Now via a button right on top of the speaker. It also has a lantern-like design that allows it to pump out 360-degree sound, so regardless of where you are in relation to the speaker, you’ll be able to hear it. The Charge 4 is the newest in the line-up and has a few minor improvements that might persuade some to get it, but most people could save some money and just go with the previous Charge 3 or the more compact Flip 4. While the Charge 4 does have a new connectivity option to pair up a bunch of speakers together, everything else is still basically the same including the sound quality. The Charge 3 provides 20 hours of playback time and can charge your mobile devices via the integrated USB output. Atop the speaker are basic playback and volume controls, a Bluetooth pairing button, and a JBL Connect toggle. This lets users sync up to newer JBL speaker models. If you think you’d want to use this with 100 other JBL speakers, then definitely get the newer Charge 4 but otherwise, this will suffice. You’ll get the benefits of a large speaker which include sound and battery life, in a size that can easily fit in a suitcase or backpack. The IPX7 Charge 3 is covered in fabric that protects the drivers on the inside and, just like the Flip 4 and Xtreme, it too has an exposed bass radiator. This means that not only will the low-end sound slightly better, but it will look way cooler (especially if you get a little water on it). Needless to say, if there’s any vulnerable spot on the speaker, it’s this. Still, if JBL says it can be submerged for up to 30 minutes in one meter of water, we’ll take their word for it. Unlike the disc-shaped UE Roll 2, the Wonderboom has a classic cylindrical shape: it’s a short and pudgy with the signature + and – volume buttons that come on UE products. Sound quality is just OK, but that’s not what we’re looking for when on the hunt for waterproof speakers. We need it to be durable and the UE Wonderboom is; plus, it has an IPX7 rating to show for its durability. Additionally, the speaker can float: making it a great waterproof speaker for the beach, since you can drop it and not have to worry about losing it to Davy Jones’ locker. The fabric covering that wraps around the speaker is dual purpose, as it protects the internals of the speaker from water but also does a great job at providing grip for the user even when the speaker is soaking wet. The Wonderboom’s elastic speaker leaves a lot to be desired. It’s barely large enough to hang on a towel rack. Another gripe is the battery life of this waterproof speaker. We were able to get two hours of constant playback while testing, To be fair, a UE rep said that it must have been an issue with our review unit. Hopefully, you fare better than we did. Still, even with our battery troubles, we couldn’t help enjoying the Wonderboom. It’s one of a few stand-out waterproof speakers that’s perfect for picking up and throwing in your bag on your way to the beach or to a friends house. Anker is no stranger to making affordable products that get the job done. But the new Soundcore Flare does more than sound good for the price. It also looks good. It’s hard to find a budget speaker with any amount of style and if you do, it usually sounds terrible. The Soundcore Flare might not be the best-sounding speaker on this list (see: JBL Charge 3), but it does more than we expected. Lows are strong and defined while vocals and other instruments in the mids come through mostly clear. There is some slight distortion in the highs, but it isn’t a deal-breaker. It’s the design that makes this worth the money. The Soundcore Flare waterproof speaker is wrapped in an IPX7 fabric and can play music in any direction, thanks to drivers that are placed all around the cylindrical speaker. Battery life is just okay at about 12 hours, but it’s enough to power the colorful LED halo on the bottom. Unlike some other products that use colorful lights to look cool, the Soundcore Flare does it tastefully with the lights being more of a design accent than the main feature. Throw in the fact that you can pair two of these together for double the sound and it’s a steal. Especially since one of the only downsides would probably be that it doesn’t get very loud, so doubling up on the waterproof speakers is a nice workaround. There are literally thousands of waterproof speakers you can choose from, and we went with what we think are the top five. If none of these are really what you were looking for, here’s a short list of products that we considered, but for one reason or another ended up being scrapped. Sony XB-41: Sony makes some of the best speakers around, and its waterproof speakers are no different. The XB-41 is a solid choice that was our best all-around pick for a long time, but it was kicked out by the more nimble and portable Boom 3. Braven Stryde 360: Though it isn’t the prettiest or the best-sounding speaker in its price range, it’s certainly one of the most durable. If you want to bring some sound on your adventures this is a solid option. 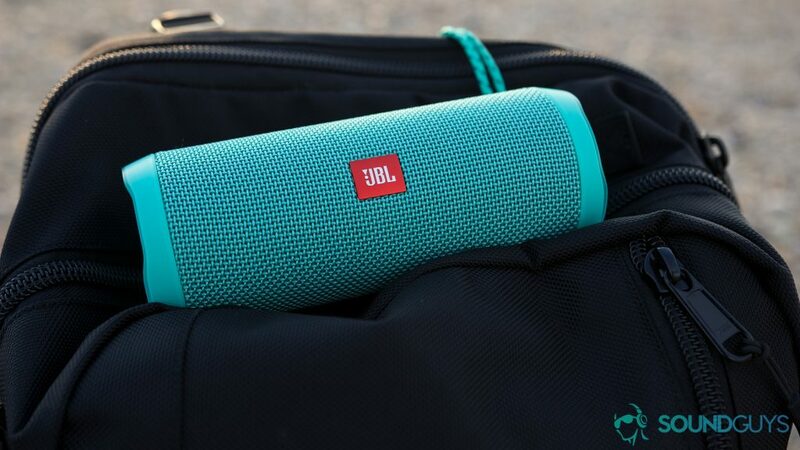 JBL Flip 4: If you’re looking for a waterproof speaker that’s less than $100 to bring to the beach or the pool, the Flip 4 is one of the best around. It used to be on this list as our bang for your buck pick until the Anker Soundcore Flare came around. UE Megaboom: It doesn’t quite stand up the best in its price range, but this is an excellent speaker nonetheless. UE Roll 2: It was already one of the best speakers you can get for the price, and the new and UE Roll 2 is even better. It isn’t much of an improvement over the original, but it is an improvement. It used to be on this list until the Wonderboom rolled around and replaced it. Why? Because the Wonderboom floats which we think is way more useful than being able to survive submersion. Bose SoundLink Micro: If you’re knee-deep in the Bose ecosystem and want a travel-friendly speaker that can withstand nearly anything, the SoundLink Micro is a great addition to have. Sharkk Commando: If all you care about is bringing your sound with you to the beach, the Sharkk Commando should be on your shortlist. Just don’t expect amazing sound quality. Altec Lansing LifeJacket 2: Another floating speaker that’s perfect for playing near water is the Lifejacket 2 by Altec Lansing. It might not be as pretty or as portable as the UE Wonderboom, but it does have Qualcomm’s aptX codec for higher quality streaming so if the sound is a priority for you this is worth a shot. Anker Soundcore Sport XL: Anker has made yet another quality bang for your buck speaker. For the price, you can’t go wrong. 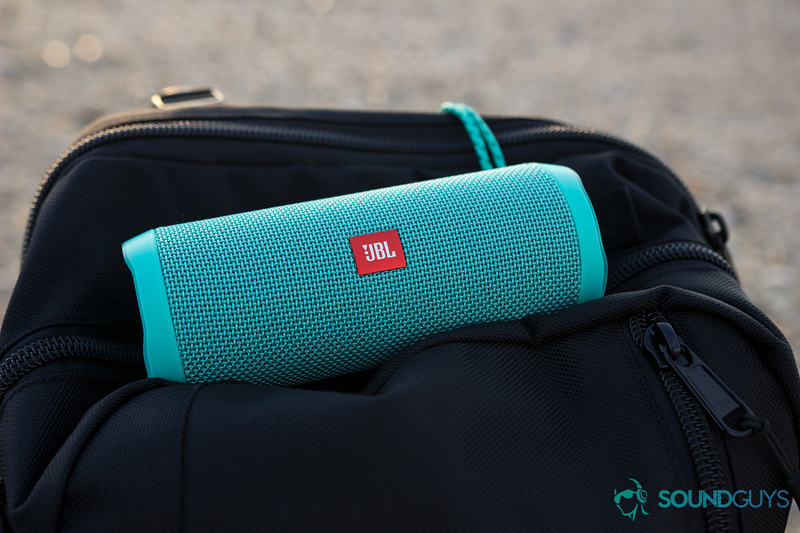 JBL Charge 4: The JBL Charge 4 is a minor update to the Charge 3 and is a little heavier. However, if USB-C charging is a top priority, the upgrade may be justifiable. JBL Clip 3: The Clip series has always been one to keep your eye on, but with a new design and a greatly improved battery life the Clip 3 is finally a true contender. Especially since you can usually find it for about $50. Depending on where you’re going to be using the speaker, some things might be more important than others. If you’re taking it to the beach you might not be so worried about water damage (unless you plan on losing it in the ocean) but dust and sand resistance is probably something you should consider. Likewise, if you’re going to be using it poolside, there isn’t going to be a lot of sand around. But if it accidentally gets knocked into the pool, it’s good to know just how waterproof it is. The JBL Flip 4 can connect to two smartphones simultaneously, which is good for you and a friend to pass the role of DJ back and forth. 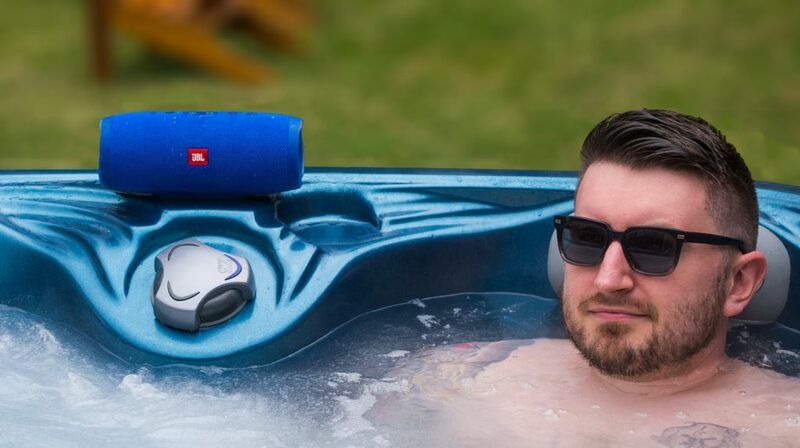 So, what are the benefits of a waterproof speaker? Besides the obvious advantage of not having to worry about water damage, they’re also usually fairly durable. Like any electronic dropping, it isn’t a good idea. But these devices are made with the knowledge that users are going to be taking them out of the house, so they’re usually a little more durable than your average speaker. Another clear advantage is portability. For the most part, these speakers are intended to move around easily with you. Sure, there are beefier options out there for those of you who prefer sound quality over portability, but most are small enough to easily toss in a bag on your way out of the house. As always there are some sacrifices that need to be made when you want one aspect of a product to be great, and when it comes to waterproof speakers, that thing is sound quality. Drivers need to be protected from water and dust to varying degrees which means they don’t sound as clear as their non-waterproof competitors. Don’t get me wrong, there are plenty of speakers that sound great considering they’re waterproof, but few can match comparably priced speakers designed for sound. Another big con when it comes to waterproof speakers is the price. This isn’t always the case, but most of the time waterproof speakers will be just a little bit more expensive because of the added feature. That said, if you’re looking for a waterproof speaker it’s obviously worth the extra cash. We put in countless hours of research year-round to ensure our findings are sound. It may look as if we’re relaxed, but we’re hard at work—always. Working at SoundGuys is each of our day jobs, so you can bet we’ve clocked in countless hours testing a wide array of audio products. This hands-on experience has allowed us to quickly discriminate between the good and not-so-good products out there. As far as waterproof speakers are concerned, seeing as most of these are Bluetooth each pick has to be good given Chris’ hatred for all things Bluetooth. Adam, on the other hand, has been a SoundGuy for four years now and he’s heard the best of what the audio world offers. And before working with SoundGuys, Lily spent time independently reviewing audio products, working for her college radio station, and enjoyed all sorts of highs and lows alike. If you have the time, we implore you to read up on our ethics policy.